I'm going to take the Zürich-Hamburg ICE train using my Interrail pass, and know that seat reservation is optional on this Train. As I've never Interrailed before, I wonder: what would happen in case all places are sold out on a train where reservation is not compulsory? The train still leaves because the staff decides it is safe. This will typically be the case if there are people standing in the corridors, but it is not fully packed and people can still walk back and forth. Occasionally, the first class is opened to second class passangers (more likely on regional trains, though, where the price difference is less). The train won’t leave because staff decides it is no longer considered safe. The police is called and forcefully removes random people from the train. Once enough people have removed themselves/have been removed, the train leaves with often considerable delay. To reduce your odds of falling victim to the second bullet point, it is helpful to be among the first to board a train, even if that involves an odd bit of pushing and shoving (seen as highly unfriendly, of course; don’t overdo it!). Typically, those closest to the exits will be removed if the police are called. Also, when grabbing any empty seat, make note whether the little electronic sign above it notes two stations between which the seat is reserved. Occasionally, it says ggf. freigeben instead, because somebody booked the reservation only shortly before departure, or it says bahn.comfort for a special contingent of seats offered to the frequent travellers who acquired comfort status. If your seat says neither, it is extremely unlikely that you are removed from the train. The police does not check tickets to remove any passanger preferentially. Finally, the Zürich–Hamburg train is one that is not too likely to be full — however, the peak travel times are Friday afternoons and Sundays. During those days you may have a harder time finding a seat. I haven’t had a train of that particular relation being too full to leave yet, though; and it is typically served by the oldest ICE generation. : I used to think that ggf. freigeben could also mean the train’s IT failed. Turns out that in that case the signs would read GGF. FREIGEBEN in capital letters, making it easy to distinguish the two. When I saw the all caps version (displayed on every seat, so obviously erroneous), I attributed it to a different ICE build than what I normally travel with. You would have to stand, unless there are too many people standing, so that escape ways would be blocked. In that case at first they would ask for volunteers to vacate the train (they might get some vouchers etc.). If that doesn't work out, then the police will come and remove some passengers (without getting vouchers). The last case happened some times in the last years, but it's not very regular. The first case happened to me once, and I got a 25 Euro voucher, and just took the next train, which left 30 minutes later. If you are travelling terminus to terminus on a ICE train it is unlikely that you will not be able to find a seat, especially if you are not travelling at peak business times. I have used ICE trains before without reserving and never struggled to find a seat. 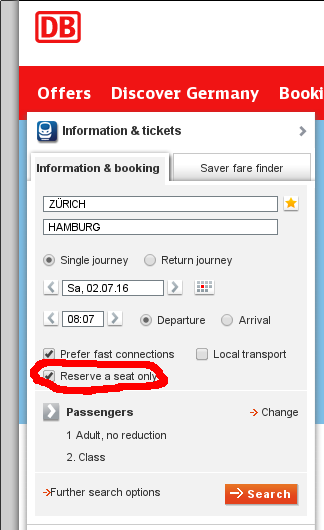 Just check the small display above the seat and be prepared to move if a seat is free now but not later; for example the seat my be free from Hamburg to Basel but booked there after. I did take a look on one of the popular English language forums for Germany just to check though, and it looks like you are able to stand, should you find there are no seats available. Not the answer you're looking for? Browse other questions tagged trains tickets germany interrail or ask your own question. Is a train reservation required or optional on ICE in the Netherlands and Germany? What will happen if 2 out of 3 seats are confirmed and 1 seat is in Waitlist which is booked via IRCTC online?